Bridget + Toray eloped on the beach at sunrise + we captured their portraits before the ceremony followed by the vow exchange + more beach time! Thank you both for choosing us as your elopement photographers on Maui! Claire + Demetrius’ Paipu Beach elopement took place at sunset on Maui and we couldn’t have asked for a better afternoon for the couple to celebrate their vows! Katy + Erica celebrated their vow exchange with a beautiful beach elopement on Maui! Their wedding day was so emotional and it was privlege to capture this moment in their lives. Check our blog soon for their day after trash the dress Land, Sea + Sky Session! Paige + Dan’s sunrise beach elopement on Maui was such a dream, made even more special by the fact that their son was present, and Paige + Dan are expecting a baby girl! Thank you both for choosing us as your elopement photographers on Maui, here’s a preview of the beautiful morning we shared! 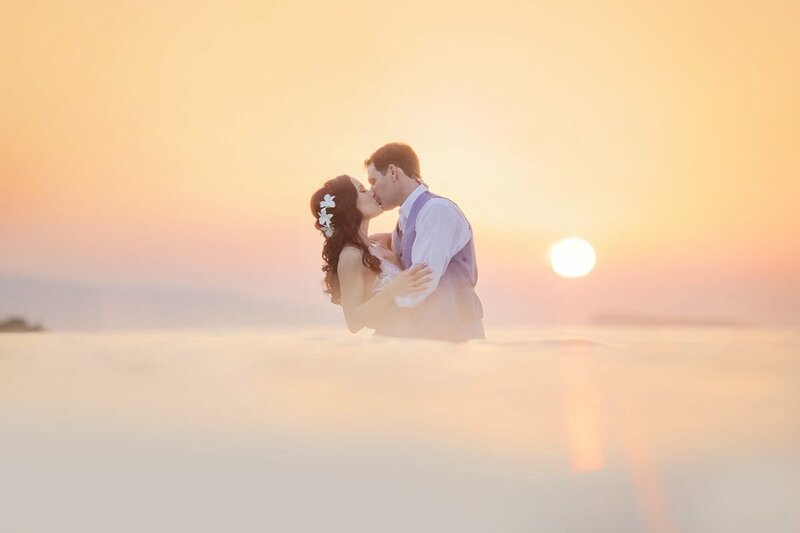 A beautiful sunset elopement at White Rock Beach on Maui. A gorgeous beach wedding on Maui with an adventurous eloping couple.